This is a sample entry from John Payne’s newsletter, This Week in Grain, published on Friday August 28, 2015. PLEASE NOTE: PAST PERFORMANCE IS NOT INDICATIVE OF FUTURE RESULTS. Nothing about the commodity markets of late have been seasonal. 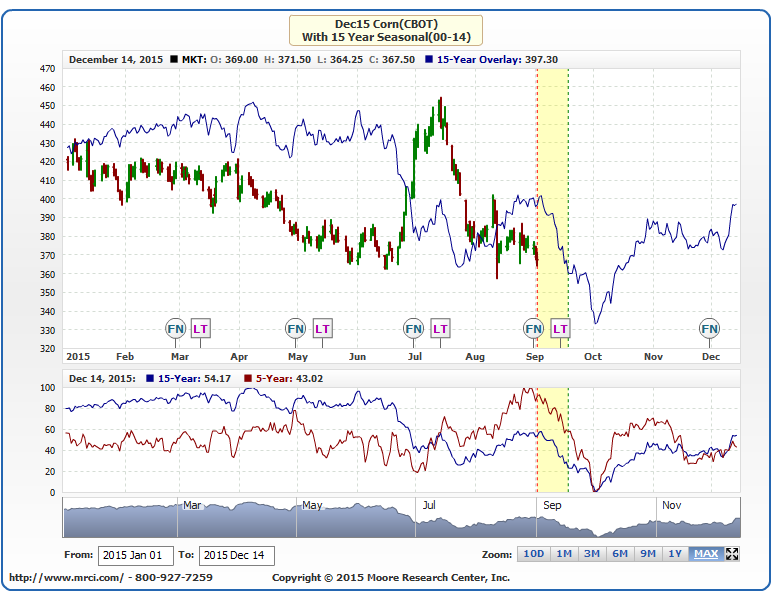 The selling we have seen in crude oil, the stock market, the dollar, heck- even soybeans, has not been seasonal. Bulls in those markets have been run over by selling pressure due to a myriad of factors; primarily the repricing of Asian risk combined with position shuffling ahead of a trend change is US monetary policy. So why am I hitting you with an article about seasonal sell pressure in corn on this beautiful Friday morning? Because I believe it to be real and combined with the other factors mentioned above, could put additional pressure on a corn market that has held up pretty well the last few weeks. If you had bought corn and sold many other markets, you would probably be munching on a cob right now in celebration. But according to MRCI’s seasonal report, the next few weeks in corn might not be so much fun. Before I dive in too deep, let me first say that if you have never heard of MRCI you should be checking them out. They have been a featured third party newsletter of ours at Daniels for years, not because they are always right, but because they provide an impartial perspective on what the data has said in the past. They are NOT predicting anything. What they do is analyze buy and sell patterns over the past 15 years and simply present the data. LEARN MORE HERE. Below is a sample I pulled from their website of a potential trade set up in corn that begins on September 2nd. The first chart is the data. This box tells us what would have happened in each of the past 15 years if you sold Dec Corn on Sep 2nd and bought back on Sep 18th. Again, it is not PREDICTING anything, simply presenting the data. You can see the worst the market did at this time over each year by date and the best. If you notice the last 4 years, 2011-2014, if you sold on the close of the 2nd, the market never broke those highs over the next two weeks. This chart is a little ambiguous. It shows the 15 year trend pattern over the Dec futures price chart. The pattern you see there is simply a pattern, again not predicting anything. If you notice in late June the seasonal pattern called for a sell of corn, which would not have performed well in the face of fundamental supply uncertainty. Could we see something like that again in corn over the short term? Maybe, but it would need to come from something like an early frost and I don’t see that in the longer term models at this point and soybeans would be more susceptible. Other than that I can’t see anything fundamental that would shock supply other than the USDA changing it up. SO that’s our risk. I know what you are thinking as you read this. You’re asking, “John, what do I do with this data?” I would be selling corn here using this as my guide. I think there are a few reasons why corn prices will not go lower, one being the fact that prices have held in pretty well this week. Markets that don’t break on bearish macros are typically not bearish. But I think Corn has been the whipping post of the funds for a lot of the year and the idea that China hasn’t been in our market for a while have kept macro sellers at bay, combined with spread unwinding. The other would be that almost everyone I read believes the yields to be much worse than the USDA has posted, which keeps some bullish enthusiasm alive and farmers long the market. Here is my refutation to the second point about yields. I don’t believe the USDA will adjust yields more than a bushel lower in this report because they haven’t adjusted the crop progress numbers more than a point since last report. Why would they adjust yield without adjusting the progress data? And even if they are wrong about production numbers, I don’t think the market realizes it until next year. Think about it this way. Let’s assume you believed you made 100,000 dollars in income this year when in unknowingly to you, you only made 90 k. In the short term, you can live like you made 100 k because your budget won’t feel the shortfall until later next year when reality sets in. That’s how I see this corn yield market right now. So what if yield is 3 or 5 bushels less than what the USDA says? All the market will see in the short term is a lot of old crop corn coming to market combined with harvest pressure from bushels out of the fields. The result will probably be price over shooting which is why I would be looking to buy major breaks in corn, especially Dec 16 of next year (another trade for another day). I like keeping my risk fixed in this environment, so I would look to play this seasonal with in the money short term put options. I like the 390 put. Right now futures prices in December (Oct options trade off Dec futures, expire Friday Sep 25) are going for 3.76, while the Oct 390 put is going for around 19 cents. That gives you high delta exposure for the next 3 weeks where the put will trade more like a futures contract than the Dec options at the money, while keeping your risk fixed. If the seasonal is wrong again and we see a price spike, you can only lose 19 cents plus fees on expiration. This option will give you exposure through the Sep USDA report and the start of harvest. I hope this was understood and clear. I think seasonal trading is a fantastic way to trade but you need to have proper expectations. Please call your Daniels Advisor for more information on this idea, or email me. I’m happy to help. This comprehensive ebook, compliments of Guy Bower, is designed to help you understand and master the fundamentals of futures spread trading.